Bingo is a popular game that is being played throughout the world. There are two general ways of playing bingo, the conventional 75 number bingo card or 90 number bingo card. 75 number bingo is commonly played in North America, while 90 number bingo is commonly played in other parts of the world. In the conventional 75 number bingo, players are provided with bingo cards that have a grid of five horizontal rows and five vertical columns. The columns are lettered B I N G O across the top with each letter corresponding to each of the column. Each bingo card has five numbers in each row except the N column which has a “free space” in the middle square. Bingo balls are individually numbered 1-75 and are mixed together; then, they are randomly selected one at a time. As each ball is selected, the caller announces the number to the players. 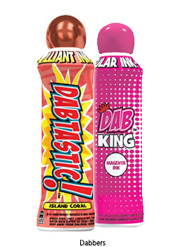 Each player then dabs or marks the corresponding numbers on their bingo card(s) using a bingo ink marker or ink dabber. At the beginning of each game or session, a predetermined playing pattern is announced along with the available prize. When a player dabs all of the numbers on the card in the correct predetermined playing pattern, that player yells out “Bingo!” Once the winning bingo card is verified as being correct, that player then wins the game and the prize. In order to win the game in the conventional version of bingo, a player must dab five spaces in a vertical column, a horizontal row or along one of the two diagonals of the bingo card. 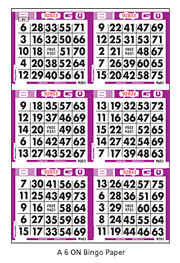 The “free space” in the center of each bingo card is considered “wild” and can be used with other dabbed spaces to create other winning patterns. There are many winning patterns that can be used in the game of bingo. For example, the winning pattern can be shaped to form a letter X, T or L. It is also popular to play “coverall” or “blackout” games in which the players must dab all 24 numbers on the bingo card in order to win the game. It is the responsibility of the caller of the bingo game to clearly identify the playing patterns for that particular game or session. A flashboard and/or television monitors are commonly seen in bingo halls to assist the players by displaying this information during the game and/or session. Many bingo halls also sell pull tab tickets during and in between bingo sessions. 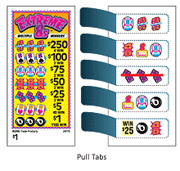 Pull tabs are similar to lottery tickets in that players can win prizes instantly. This extra game adds additional excitement to the bingo session while increasing the players' chance of winning more prizes. To play in a bingo session, players must purchase bingo cards. Usually, there is a "buy-in" amount which is the minimum to join the game. The purchase amount for each session creates a pool of money that funds the pre-announced cash or merchandise prize for the bingo sessions. Typically, a bingo session includes a number of individual bingo games concluding with a coverall game in which a large prize is awarded. The other variation of bingo known as 90 number bingo is generally played in Europe and South America as well as in other parts of the world. In this game, there are ninety numbered bingo balls without letter designations. Each player must purchase a bingo card with three horizontal rows, each row having five numbers therein with the rest of the row comprising blank “free space.” The caller draws numbers randomly from the group of ninety numbered balls and a player wins when they cover all five numbers called on a single horizontal row of the bingo card.